The Phillies (54-63) continue their road trip on Thursday when they head to Milwaukee to begin a four-game series against the Brewers (52-64). Both teams have struggled this year and find themselves placed distantly back in the standings as the season begins to approach its final month. The Brewers have dropped five of their past six contests, while the Phillies have been victorious in four of their past six games. In the series opener, the Phillies will send lefty Cliff Lee, who surrendered 6 earned runs in 7 innings of work against Milwaukee in a start on July 24th, to the mound. The Brewers will counter with right-hander Marco Estrada, who hasn't recorded a big league win since August 23rd, 2011. Read ahead for details on the pitching match ups and other key statistical info from this series. Thursday, 8:10 PM. 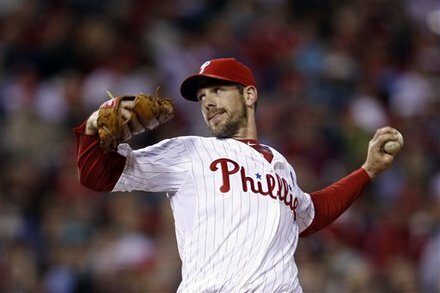 Cliff Lee (2-7, 3.85 ERA) vs. Marco Estrada (0-5, 4.36 ERA). In 4 career starts against the Brewers, Lee has a 0-1 record with a 5.54 ERA. Lee has a 3.21 ERA in 11 road starts this season. Corey Hart is 4-for-9 (.444 avg) in his career against Lee. In 7 career games against the Phillies, Estrada has a 7.84 ERA. Estrada has a 0-2 record with a 4.11 ERA in 10 home games (8 starts) this season. Chase Utley is 3-for-3 with 3 doubles in his career against Estrada. Friday, 8:10 PM. Vance Worley (6-7, 3.97 ERA) vs. Yovani Gallardo (11-8, 3.78 ERA). In 9 road starts this season, Worley has a 4-3 record with a 2.59 ERA. Worley has a 2-2 record with a 5.03 ERA in 6 starts since the All-Star break. In 2 career regular season starts against the Phillies, Gallardo has a 2-0 record with a 1.98 ERA. Gallardo is 6-3 with a 3.40 ERA in 13 home starts this season. Saturday, 7:10 PM. Cole Hamels (13-6, 2.91 ERA) vs. Mike Fiers (6-5, 2.63 ERA). In 12 road starts this season, Hamels has a 7-3 record with a 3.07 ERA. Hamels is 2-1 with a 4.25 ERA in 5 career regular season starts at Miller Park. Nyjer Morgan is 0-for-8 in his career against Hamels. In 9 home outings this season, the righty Fiers has a 4-3 record with a 2.22 ERA. Fiers allowed 8 earned runs in 2 innings of work in his last start against Colorado. Sunday, 2:10 PM. Kyle Kendrick (5-9, 4.53 ERA) vs. Randy Wolf (3-9, 5.65 ERA). In 6 career regular season outings against Milwaukee, Kendrick has a 0-3 record with a 4.82 ERA and a .315 batting average against. Kendrick is 3-3 with a 3.97 ERA in 15 road games (7 starts) this year. In his last 5 starts, the lefty Wolf is 0-3 with a 5.83 ERA. In 8 career regular season starts against the Phils, Wolf has a 3-2 record with a 3.86 ERA. Aramis Ramirez is batting .325 with 9 homers and 42 RBI in 55 home games this year. In 29 games since the All-Star break, Ramirez has posted a .348 batting average. Corey Hart is batting 65 points higher at home than he is on the road this year (.296/.231). Also, Hart's OPS is 293 points higher at home this season (.963/.670). In 55 home games this year, Rickie Weeks is batting .219 with 5 HR and 24 RBI. In 55 road games this season, John Mayberry Jr. has posted a .206 batting average with 4 homers and 13 RBI. Mayberry is a .208 hitter in 10 career games against the Brewers. Ryan Howard has posted a .098 average in 14 road games this season. In 20 regular season games at Miller Park, Howard has a .280 average with 5 HR and 18 RBI. Erik Kratz has a .133 average with just 1 extra base hit, a double, in 8 road games. Jimmy Rollins is batting .221 with 7 HR and 20 RBI in 58 road games this season. Rollins is batting .217 in 30 games since the All-Star break.